The Lakota People’s Law Project stands in solidarity with all those affected by recent instances of police brutality towards innocent minorities. While this matter has been gaining well deserved media attention lately, it is by no means a new issue. Native Americans have been subjected to these violent encounters with law enforcement as well. 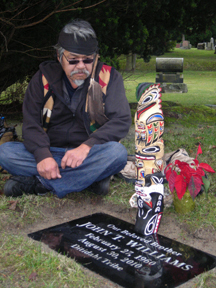 In 2010, hearing impaired John T. Williams died after being shot four times by a Seattle police officer. Officer Ian Birk grew suspicious when he saw the 50-year old crossing and intersection holding a carving knife and block of cedar wood. Birk waited a mere 4 seconds after his initial call to drop the blade before beginning to shoot. A bullet to the chest ultimately killed Williams, whose knife happened to fall below Seattle’s legal limit for knives. Prosecutor Dan Satterberg did not pursue charges against Ian Birk. Last August, Rebecca M. Sotherland of the Oglala Sioux Tribe police force was indicted for Deprivation of Rights Under Color of Law and Assault with a Dangerous Weapon after a video of her repeatedly tazing an unresponsive man went viral. It appears that the victim, who lay handcuffed and motionless on the ground beside Sotherland’s squad car, was tazed a total of 17 times. The officer’s inappropriate use of her defense tool and repeated warning of “it’s gonna get you again” were eventually stopped by onlookers who offered to carry the man into the car. While we are encouraged to see due attention turn toward the policing of black communities, it is the job of the Lakota People’s Law Project to point out that similar injustices occur in other minority community, including Indian Country. It underscores why this issue is about more than what it typically disseminated through corporate media — it’s about more than race, it’s about the responsibility of those who get paid well to protect us, it’s about the impunity attached to police officers who increasingly seem to be above the law while enforcing it. Unfortunately, for minority communities they are not getting protected by their police, but stand in dire need of getting protected from them.